Sierra Leone’s President Julius Maada Bio has called on the international community to support his administration’s National Development Plan (NDP) that was launched last Friday. Implementing the programme, which spans over five years (2019-2023), would cost $8 billion. The document represents the government’s medium-term priorities and focuses on eight areas, with emphasis on human capital and infrastructural development, promotion of good governance and protection of the vulnerable. According to the Ministry of Planning and Economic Development, some two million people out of the country’s seven million population were consulted in the process of preparing the NDP. More so, a comprehensive result and indicator framework accompanies the national development plan which officials described as a first, The East African reports. National Development Plans are not new to Sierra Leone. This is the fifth development programme since the country emerged from the devastating civil war that lasted from 1991 to 2001, destroying the nation’s infrastructure. All the previous plans have been enshrined in the global Poverty Reduction Strategy Papers (PRSPs). 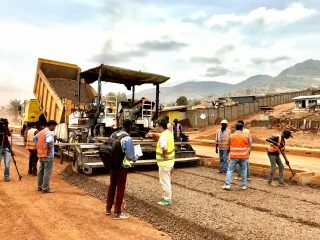 Over the last 15 years, Sierra Leone has received millions of dollars in aid to support development plans drafted by previous administrations. In spite of this, there is little to show in terms of development, critics argue. In 2018, the country ranked 180 out of 187 in the United Nations (UN) Human Development Index. There is widespread poverty, as more than 60 percent of the population live on less than $ 1.25 a day, according to UNDP. More so, unemployment among youths, the largest segment of the population, is 70 percent. And the country also has the world’s highest rate of maternal mortality, at 1,360 deaths per 100,000 live births, an illustration of the poor state of its health sector. The new government has blamed the apparent failure of previous plans on lack of consistency in implementation and absence of political will. The president has been particularly critical of his predecessor’s administration, which he said handed him a “bankrupt and battered” economy. Former military junta leader, Julius Maada Bio was sworn in as Sierra Leone’s new president last year. He is faced with the difficult task of rebuilding the impoverished West African nation’s economy that was dragged down by the world’s deadliest Ebola epidemic and a global fall in commodity prices. The NDP is anchored on the ruling Sierra Leone People’s Party (SLPP) New Direction manifesto. The plan was drafted with the support of development partners, notably the UN and the British government. It also incorporates the UN Agenda 2030, as well as the African Union’s 2063 Agenda.